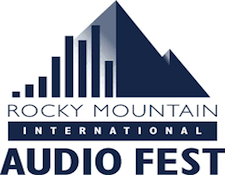 The most recent Rocky Mountain Audio Fest ended several weeks ago. 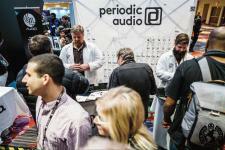 And nowhere was the divide between portable/personal next-gen audio and old-school room-based systems more pronounced than at this year's show. On Sunday morning, which is usually slow in the demo rooms, often due to late Saturday bacchanalia of late meals and even later listening sessions by many participants, the CANJAM room was still active - not has crammed as on Saturday, but still populated with music lovers of all ages. The hallways, especially in the Marriott Tower suites, were so empty you could roll the proverbial bowling ball down the halls and your chances of hitting homo sapiens were nil. Now, optimists might see the activity in the CANJAM room as a good thing for traditional listening room-based high-performance audio. 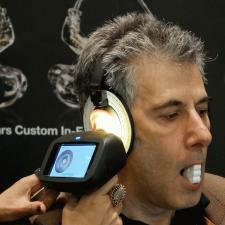 After all, these headphone fanatics are going to need a room-based sound reproduction system, eventually, right? Wrong! In fact, they may never buy a conventional two-channel room-based audio system. That's not how they roll. While I overheard lots head-Fi'ers discussing the next move upwards for their portable and personal systems, but very few I talked with had any intention of moving into a dedicated room system. For casual, background, and soundtracks for living I discovered that a good number of headphone fanatics were perfectly happy to use a lower resolution lifestyle system. Why? Because when they want to listen critically, they pull out their headphone rigs. And how about electronics manufacturers? What does the future hold for their chances to cross-over to a younger demographic? Again, I see the trend away from multiple boxes toward modular all-in-one systems that, like Vinnie Rossi's LIO, or AVM CS 8.2, can be configured in various ways to suit the owner's needs (and can be updated and reconfigured if those needs change.) And headphone amps. I heard a number of rooms with great sounding systems whose ergonomics were straight out of the 1950's. WAY CooL. But, IMHO, the odds most will still be vibrant concerns in 20 years, heck, even in ten years, is debatable. Just as your kids don't want your furniture, or your Hummel china collection, they don't want your 100-lb. single-ended triode amplifiers or your six-foot-high electrostatic panels any more than you wanted your parent's maple cadenza one-piece stereo system. So, what is my takeaway from RMAF? I think it's high time that some of the premium loudspeaker firms think about nearfield monitors and headphones. Sure, they can keep making bigger, better, and more expensive state of the art room-based reference systems, but why not also make something for 100,000 customers rather than only 2000...and then 1500...and then 1000 as the premium customers die off, are indicted for financial shenanigans, or decide to buy another boat instead...and electronics manufacturers - they need to spend more time modularizing and incorporating modern ergonomics if they hope to succeed long term.